After vacationing in the Lake George area all my life, I moved here from New Jersey. I have a financial background and previously worked as a Chief Financial Officer (CFO) in high growth technology companies. I have always had an interest in real estate and working with people. This interest motivated me to become a licensed real estate Salesperson and later a Broker/Owner. As a Bolton Landing and Lake George real estate agent, I am committed to serving clients with honesty and integrity and I treat others the way I would like to be treated. I use my experience of attention to detail, organization and negotiating skills in each and every transaction. Buying or Selling a major investment should be a pleasant experience and I strive to keep my clients experience as painless as possible. I also completed the construction of my new home in Bolton Landing in 2006. Let my experience, passion for what I do and commitment to excellence help you. Call or contact me today, I would love to help you find the right Adirondack real estate for sale, or to sell your home or Southern Adirondack real estate. When you sell your home, you want to make sure you have an agent you can trust. Holly Dansbury is that agent. 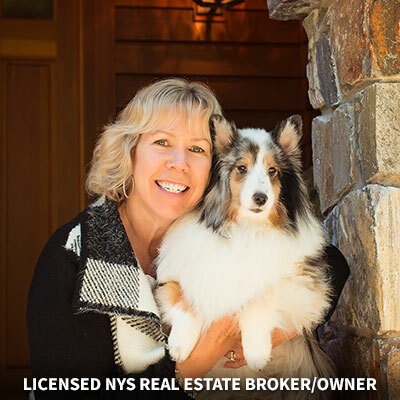 Along with her knowledge and know-how, she brings a refreshing and positive outlook to your real estate transaction here in Lake George and the Southern Adirondacks. Take a look at some of the other top reasons people selling or buying real estate in the Lake George region choose Holly. Great Negotiator. Holly is experienced at real estate negotiations. She does extensive research and provides data to substantiate a certain dollar value. She is thorough with her clients in finding out how much they need to get for their home, and how much they can spend on a new one. She has open conversations with them in regards to what she believes a homeowner should be able to get for their home, or what one can expect to pay for a particular new home. With this data, Holly is able to go into negotiations from a strong position to provide positive outcomes for her clients. Go Between for Sellers and Buyers, Other Agents. Some people would prefer to sell a home without the help of a real estate agent. This works for quite a few people. However, there are many instances during the process where the support of a dedicated real estate agent comes in handy. This is particularly true during the conversations regarding money. Buying & selling a home is highly emotional. By working with an agent, sellers protect themselves from allowing the money part of the transaction from getting too personal. Free Home Staging. Holly is an ASP (Accredited home staging professional). And if you list your home through Holly, she will provide FREE expert home staging advice and tips. This will help you sell your home faster and for more money. This is particularly helpful in today’s tough real estate market. Extensive Knowledge of the Area. Not only does Holly work in the region, she also lives right here in Bolton Landing. She has firsthand knowledge of the area, its rich history and what homeowners can expect living in such a great place. Her Website. www.HollyDansbury.com is a great resource for everybody looking to buy or sell a home. It includes great advice in the form of Real Estate Tips, Local Open Houses, Area Events and most importantly updated daily with the latest Listings in the Warren County MLS. It’s Her Only Career. While some real estate professional choose to have other jobs, Holly chooses to focus solely on real estate. Holly works full time at real estate and is always available via email or phone. She Comes Highly Recommended. Hear from Holly’s previous clients and judge for yourself. She has countless clients who are willing to speak to her honesty, integrity and results. No Hard Sell. Holly is a wealth of knowledge and enjoys helping people sell or buy that perfect home. Having to make a certain commission is not what drives her. Reputation. As in every business your reputation plays an important part in how successful you are. Holly’s reputation amongst other Realtors, and with other real estate related trades is exceptional. This helps every transaction go smoothly. Communication. Holly doesn’t just take a listing and you never hear from her. She provides feedback regularly on what she has heard about the listing, what is going on with the market, other homes in your area and more. You will never be kept in the dark when you work with Holly. Whether or not you need any more reasons to list your home with Holly, give her a call at 518-321-1870. She will be happy to answer any and all of your questions regarding the process, the Lake George region and real estate in general. As an experienced home buyer, this was our 4th home we have purchased and our experience with Holly Dansbury far surpassed any of our client/ broker relationships in the past. Our relationship with Holly started over one year ago when she was helping us find a summer home. She was always well informed, had done all the necessary research and knew the kind of home we were looking for. She was a pleasure to deal with throughout the entire process, she was considerate of our time, she was very efficient in finding us a home. At all times she was a consummate professional, starting with the housing search up to negotiations and through the closing. We always felt that Holly was representing our best interests. Most importantly we never felt pressured or forced to do anything, she would give us advice and let us make our own decisions. We always appreciated her upbeat and positive attitude, she always offered words of encouragement even during potentially stressful situations, simply put she put us at ease. There is no doubt she was instrumental in us being able to purchase our Dream home. I would highly recommend her to any potential purchasers or sellers in the future, she made this whole process flow as smooth as possible.